Here's where to watch every episode of Spider-Man season 1. Mouseover or tap an episode to see where to stream it. Click or tap the play icon to stream it on the best available service. The Time of Revenge Has Come! Beat Down Iron Cross Group!! 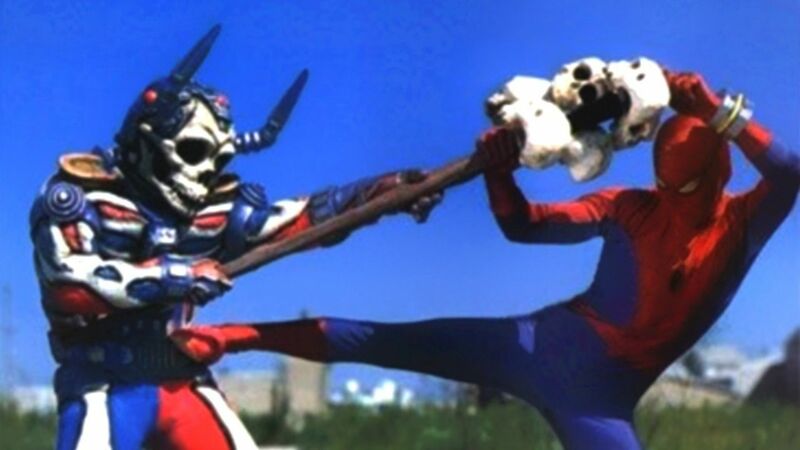 May 17, 1978 The first episode of the TOEI-produced Japanese "Spiderman" TV series sees motorcycle racer Takuya Yamashiro gain the powers of Spider-Man. With his new powers and the help of Marveller, he transforms into Leopardon in order to defeat Professor Monster and his evil Iron Cross Army. Mysterious World! The Man Lives to Fate May 24, 1978 When a train suspiciously overturns, Takuya believes Professor Monster and the Iron Cross Army are responsible, while flashbacks reveal the tragic details surrounding Garia's arrival on Earth and the transfer of power to Takuya. Mysterious Thief 001 VS. Spiderman May 31, 1978 The Iron Cross Army abducts well-know burglar, Phantom Thief 001, in hopes of grooming him into another Spiderman! Can the true web slinger stop the impostor before he wreaks havoc on the innocent? The Terrifying Half Mer-Man! Calling the Miracle Silver Thread Jun 7, 1978 Professor Monster works to create a program that can kill Spiderman, and the two men meet face to face for the first time! Crash Machine GP-7! The Oath Siblings Jun 14, 1978 Can Spider-Man stop the Iron Cross Army before they obliterate Japan with missiles? Shuddering Laboratory! Devilish Professor Monster Jun 21, 1978 The Iron Cross Army sets its sights on scientifically changing humans into super soldiers. One of their targets turns out to be Yosuke Matsuki, Tayuka's (Spiderman's) close friend. Can Spiderman stop the Iron Cross Army and protect his pal? Fearful Hit Tune! Song Dancing Murder Rock Jun 28, 1978 Spider-Man protects two scientists working to make a weapon that can target the Iron Cross Army, while Professor Monster models cyborgs out of a popular Japanese rock band! Once Upon a Time in the Mysteriousless World: The Cursed Cat Mound Jul 5, 1978 Professor Monster resurrects an ancient cat demon in hopes of killing every Japanese citizen! Motion Accessory is a Loveful Beetle Insect Spy Jul 12, 1978 Amazoness and Professor Monster send Machine Bem to go after someone close to Takuya (Spider-Man) - his sister, Shinko! To the Flaming Hell: See the Tears of the Snake Jul 19, 1978 Tragedy strikes the spectacular Spiderman as he battles Amazoness and the deadly Snake Woman. Professor Monster's Ultra Poisoning Jul 26, 1978 Ichiro, the boy saved by Takuya's (Spiderman) blood transfusion is kidnapped and Spiderman must save him before its too late. Transformation To A Splendid Murder Machine Aug 2, 1978 A lovesick model is tricked into getting a chip implanted into her brain by Amazoness in order to win back her old flame. Now, Amazoness has complete control over her and Spiderman must stop her before she assassinates enemies of the Iron Cross Army. Skull Gang VS. The Devil's Hearse Aug 9, 1978 When a motorcycle gang encounters the Iron Cross Army, Professor Monster decides to take their leader captive and turn him into a machine bem. When Spiderman is approached by the gang leader's father for help, he tries to reunite the father and son. Dedicate the Song of the Powerless Brave to My Father Aug 16, 1978 The Iron Cross Army suspects Spiderman's secret identity and uses it to kidnap his closest friends and family. To confirm their suspicions, the Iron Cross Army tries to force Takuya to change into Spiderman while in public. Now,without being able to change into Spiderman, Takuya must try to save his friends and family before it's too late. Our Promise of Life Aug 23, 1978 Spiderman befriends a boy with a heart condition and promises to be there for his surgery. But when the Iron Cross Army discovers that Spiderman will be at the hospital, they set a trap to capture the hero. Now, Spider-man must battle the Iron Cross Army to keep his promise. Clever Dog, Run Back to Dad! Aug 30, 1978 The Iron Cross Army devises a plan to poison the city's water system by destroying the dam. Spiderman stumbles on the plan when a boy and his dog are attacked by the Iron Cross Army while hiking in the woods. Now with the help of the boy and his dog, Spiderman must defeat the army and their monster before the city is poisoned. Tears of Samson, The Professional Wrestler Sep 6, 1978 Samson, a struggling professional wrestler and his brother search for Spiderman to ask for help in their training. The Iron Cross army intervenes and turns Samson into a machine bem forcing Spiderman to fight against a once innocent man. The Boy Who Restores His Faith In His Mother Jun 13, 1978 The Iron Cross Army causes disturbances around Japan in order to incite confusion and break the human spirit. A young boy and and his mother are framed by the Iron Cross Army and falsely accused of stealing five million yen. After hearing of their plight, Spiderman decides to help and comes across the fearsome machine bem Carnivorous Plant! Phantom Boy and a Village that Doesn't Exist on a Map Sep 20, 1978 A strange boy enters Takuya's life and claims to know his secret identity. The boy leads Spiderman to a hidden village where he pleads for help to save his sister. After encountering some hostile villagers, Spiderman discovers that this was no oridnary rescue. The boy's sister is being held captive by the Iron Cross Army! Riddle: Calling the Riddle of My Secret Birth Sep 27, 1978 A young girl possessing psychic abilities is targeted by the Iron Cross Army so that they could learn future events. Lucky for the young psychic, she has hired Takuya (Spiderman) as her tutor and he has taken it upon himself to act as her protector. Spiderman must keep the Iron Cross Army away from the psychic not only to keep her from harm, but to prevent the Iron Cross Army from destroying the world. Father's Love Sparkles in the Sky Oct 4, 1978 Tsuda, an undercover investigator from Interpol's Intelligence Department stumbles across an Iron Cross Army training sessio and is captured and tortured. Meanwhile, Spiderman meets a young painter who seems to have recently lost both his Mother and Father. While investigating an anonymous tip, Spiderman finds Tsuda and saves him from the Iron Cross Army and finds out that this man is actually the young painter's father! Tears of a Dark Fate for a Father and a Daughter Oct 11, 1978 Professor Monster is weakening after living for 400 years and needs live human blood in order to renew his life energy and live for another 400 years. Amazoness sends out Skeleton Beast to hunt live humans and harvest blood. They kill a father and leave his daughter blind. When Spiderman hears about the story, he goes to visit the girl who eventually leads him to Professor Monster himself! A School of Love for Children Without Homes Oct 18, 1978 The Iron Cross Army is luring young men into casinos that they've set up around the city to corrupt their minds and take their money. When Goro, a former orphan steals the deed of his old orphanage to make one last bet and loses, Spiderman must get involved. Now he must face Machine Bem Sorceress Beast in order to get rid of the Iron Cross casinos and get the deed back! The Treasure, The Dog and The Body Double Nov 1, 1978 A former burglar named Phantom No. 107 has been abducted by the Iron Cross Army to obtain an ancient Egyptian treasure that was stolen by him years ago. After the old burglar dies, the Iron Cross Army goes after his grandson and Spiderman must stop them before they hurt an innocent child. The Fake Hero in a Treacherous Predicament Nov 8, 1978 A young student who is fed-up with his uneventful life is approached by the Iron Cross Army with a plan to trick the public into thinking that he is Spiderman. The Iron Cross Army plans to use the young student to involve Spiderman in scandals that will ruin his reputation. Will Spiderman be able to stop the Iron Cross Army before his reputation is tarnished, or will this be the end of Spiderman for good?